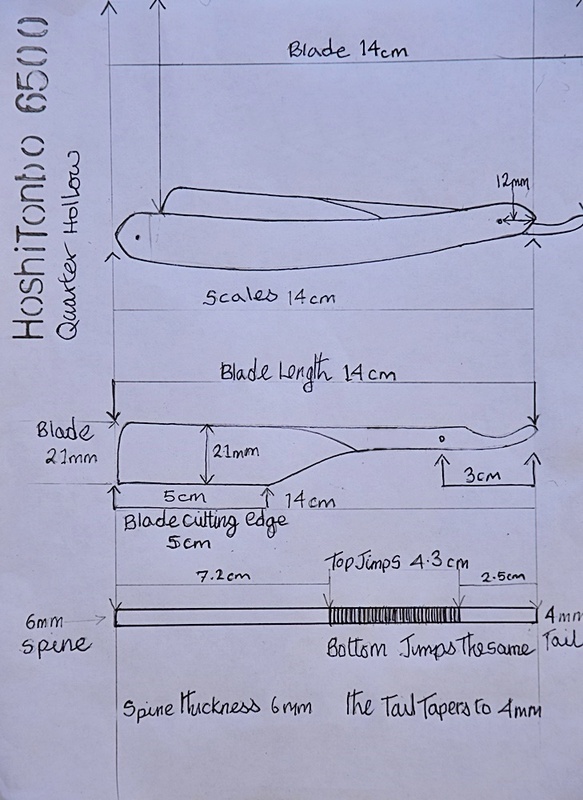 I wanted to own something a little different with a modern twist, so I decided to go with a razor I own and a razor really enjoy, so I set about taking all the measurements including all the specification from my original vintage Japanese Hoshi Tonbo 6500 First Edition, I sent the drawing along to Cedric telling him exactly what materials and steel I wanted, and this is what Cedric came up with. Cedric Christ Custom commission, a modern twist Tribute Hoshi Tombo 6500 First Edition - Suminagashi White Paper steel & Carbon fibre. I'm generally ignorant regarding steel types and qualities. Can you comment on what the properties of this razor are likely to be apart from it's impressive appearance? Interested in your feedback regarding how it shaves as well. I kept the razor spec's exactly the same as my original vintage Hoshi Tonbo, a quarter hollow grind 13/16. Japanese Multi-Layered Steel „Suminagashi“ ... The finest 22-layered Suminagashi steel with a medial layer of White Paper Steel. The multi-layer steel can be ground or forged and then hardened to produce blades of both incredible sharpness and resilience. Thanks Jamie, looking forward to hearing how it goes. Looks like it would be an interesting razor to shave with given the blade looks much wider than 13/16 (so must be a bit shorter than the usual western straight). I love the pattern. Yes indeed the actual cutting edge only measures 2" inches, here's the drawing I sent Cedric, If anyone wants to use the drawing for a future project please feel free to download it. How close was the grind to the original? Did he manage to get it spot on? When it comes to grinds, Cedric is one of the very few custom makers who can actually produce a true full hollow, so when you ask him to produce a wedge a half or a quarter hollow that's what you will get.